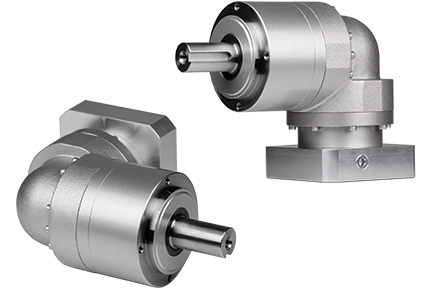 The right angle equivalent to the VRL series, the EVL provides our customers with an excellent solution when space and clearance are a serious limitation. 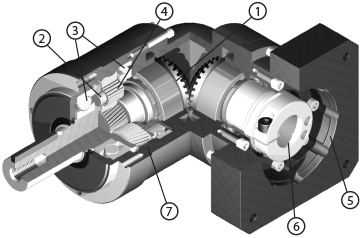 Helical planetary gears team up with spiral bevel gears to provide a product with robust internal construction, smooth operation and high torque density. 6 arc-min backlash allows the VRL to be applied to a wide range of applications where accuracy and dynamics are in play, but cost is of concern. The EVL is a solid choice for servo applications in packaging, handling and automation systems. A variety of standard wash down and food grade options are available, making it an attractive option for the toughest environments. We offer the broadest selection of frame sizes and ratios, giving our customers more flexibility than ever before. Industry standard mounting dimensions allow the EVL to be implemented in legacy machine designs, saving our customers valuable time. *1) Motor mounting code varies depending on the motor. Use the selection tool link below to configure the code.